The findings, which were published April 11th in Science and featured on its cover, show that Scott experienced thickening of the carotid artery, thickening of the retina, weight loss, shifts in gut microbes, reductions in cognitive abilities, DNA damage and changes in gene expression, and a lengthening of the ends of chromosomes called telomeres during the flight. Upon return to Earth, the telomere elongation was replaced by accelerated shortening and loss, a potentially negative consequence for cellular health. The study will help scientists better understand the changes astronauts undergo during long-term space travel. It may also help them better treat or prevent any damage to astronauts’ health caused by prolonged spaceflight, particularly as NASA and other groups prepare for three-year missions to Mars. “It gives us a biomedical and molecular road map for future astronauts,” said Dr. Mason, who is also an associate professor of computational genomics in computational biomedicine at Weill Cornell Medicine’s HRH Prince Alwaleed Bin Talal Bin Abdulaziz Alsaud Institute of Computational Biomedicine, an associate professor of neuroscience in the Feil Family Brain and Mind Research Institute, member of the Sandra and Edward Meyer Cancer Center, and director of the WorldQuant Initiative for Quantitative Prediction. 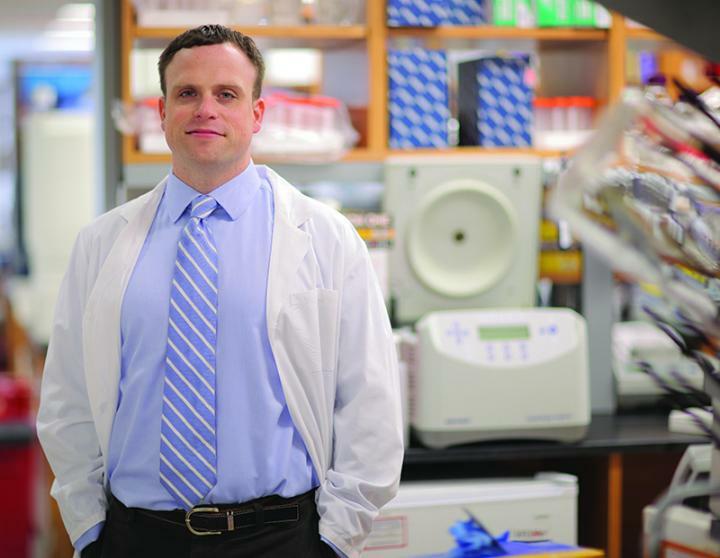 Dr. Mason led the genetic, gene expression, and epigenetic investigations for the study. The 10 teams of investigators, which included co-investigator Dr. Ari Melnick from the Weill Department of Medicine, were selected in March 2014 and had just a few months to prepare the protocols they would use to collect and analyze samples from Scott and Mark. During the mission, Dr. Mason’s colleague, Dr. Francine Garrett-Bakelman, then a joint post-doctoral fellow in Dr. Mason and Dr. Melnick’s laboratories, collected in Houston the samples of Scott’s blood that he sentback to Earth, and analyzed them within 36 hours. “Gene expression changed dramatically,” Dr. Mason said. “In the last six months of the mission, there were six times more changes in gene expression than in the first half of the mission.” While many of the changes reversed after Scott returned to Earth, a few remained, including cognitive deficits, DNA damage and some changes in T-cell activation. The study may also help patients on Earth, particularly those with cancer who often undergo dramatic genetic changes and endure radiation exposure. Studying both a healthy human on Earth in great detail as well as a person exposed to tremendous stressors in space can give scientists new insights into what is a normal response to stress and how much the body can adapt. This may help scientists distinguish the body’s normal stress response from pathological changes associated with cancer, infection, or other stressors. Useful new tools have also emerged from the study, including portable DNA-sequencing techniques created by Dr. Mason’s team that will be used by astronauts to sequence their own DNA on future space missions. In 2016, during NASA’s year-long Biomolecular Sequencer Mission, Dr. Mason and colleagues demonstrated that DNA sequencers can function on the International Space Station. Building on that finding, Dr. Mason’s group in 2019 published a machine-learning algorithm in Nature Communications revealing that the technology can also detect epigenetic changes in space. This work is funded by NASA and the Translational Research Institute for Space Health to help the new set of additional year-long missions on the ISS and to prepare for Mars. The same technology is now being used to help control disease outbreaks, including Ebola in West Africa and Zika in Brazil, by providing a portable sequencing tool that can be used in the field, he said. Through a Cornell Tech start-up called Biotia, for whichDr. Mason is a co-founder and equity holder, the DNA sequencer is also being used in several international hospitals to track infections, helping to pioneer faster DNA testing methods for all hospitals, including in New York City.